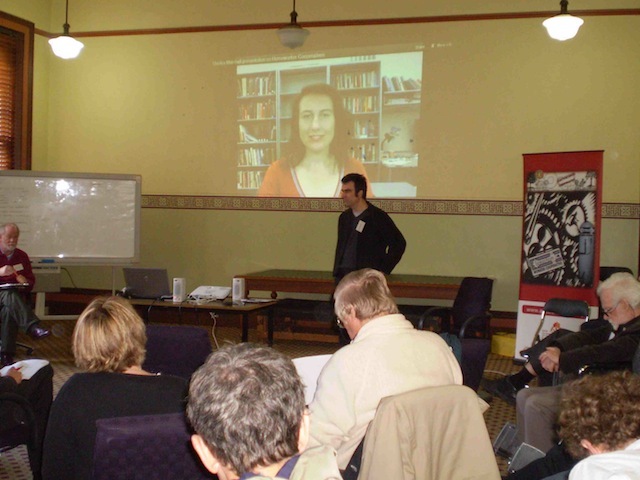 The gathering, “Economics for the 99%: Co-operatives in Victoria”, on Saturday 11th August at the Melbourne Trades Hall, was a great morning. A buzz developed as veteran and aspiring co-operators, and the merely curious, digested a feast of YouTube-length quick-fire reports on co-operatives past present and future. The welcome and acknowledgement of the traditional owners of the land by Cardijn Community Australia president Guido Vogels was followed by Cardijn Community International president Stefan Gigacz, who presented some recent research into early twentieth century Belgian Fr Joseph Cardijn, founder of the Young Christian Workers movement. Stefan had been surprised to find the extent to which cooperatives played a part in Cardijn's thinking. With trade unions, co-operatives can be seen as the second pillar of his social action. Cardijn began numerous co-operatives, one of which became a Belgian savings bank that survived until the de-mutualisation of the 1980s. YCW veteran Bob Maybury OA told the remarkable story of the Victorian YCW’s post-war co-operative achievements in housing co-operatives, trading co-operatives, some small land developments, and especially its grand pioneering role in the credit co-operative movement, which it then helped spread to local community and industry groups. These initiatives, said Bob, had stemmed from real needs which had been discerned through Cardijn’s ‘See Judge Act’ method: young couples firstly needing somewhere to live, and then needing credit to buy appliances and furnishings at competitive prices. Only the present generation could say what was needed now. Des O’Connell, 97 year-old pioneer of the post-war Maryknoll rural Christian community, gave us a glimpse of the life and achievements of the scores of families who came together with Fr Pooley to live and work together. He had been project manager of Maryknoll’s Building Co-operative, which at one stage had been despatching a completed portable classroom every day. While employment in the 1950s pioneering-period had been in farming, craft and building initiatives, they had also envisioned (but not realised) specialised technological enterprises. ‘Where we succeeded’, concluded Des, ‘it was because of love; where we failed it was because of lack of love’. 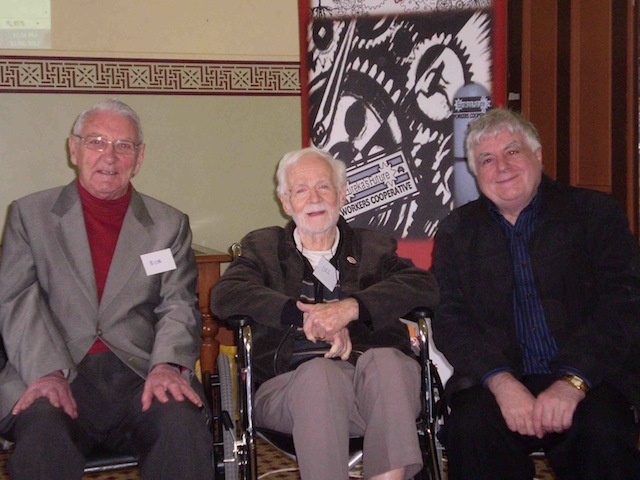 Stalwart co-operative activist and Acting Chairman of Co-operatives Australia, David Griffiths provided valuable reflections on a lifetime of experience with co-operatives, including their decline in recent decades. There was particular interest in and discussion of some of the lessons to be learnt, including the failure to educate co-operative members in co-operative ideology and methods. This left co-operatives vulnerable to disconnected managerial boards, and members with little awareness of being part of a co-operative ‘movement’. Even the word ‘co-operative’ was now being replaced by other words. Senior Monash University research fellow in business & economics, and author of Jobs of Our Own: building a stakeholder society, Hon Dr Race Mathews first reminded us of the historic nature of our gathering. We had heard from three generations, dating to the 1930s depression, who had lived their whole lives as part of or on behalf of co-operatives. He then argued strongly that co-operatives had always been simply, essentially, about people joining together to fulfil concrete needs. One need we all have is for ‘work’, and perhaps the time has come again for co-operatives, particularly worker co-operatives on the Mondragon model. After morning tea we heard of current co-operative initiatives. Senior lecturer in Business Law and Taxation at Monash University Shelley Marshall sent a short video presentation, in which she hoped that a ‘Home Workers’ co-operative might reduce isolation regarding wages and conditions, help achieve more ethical business model for piece workers. Many in the garment industry, providing everything from fashion ware to school uniforms, would support this, and Shelley invited feedback on its operation. Dave Kerin, Earthworker co-founder and representative, told how this model provides innovative ways to begin production of solar hot water units, financed through microcredit, with possible assistance from ethical superannuation funds, and distributed initially through the union movement via enterprise bargaining. It is hoped that this co-operative model will roll out to other sites such as Freemantle (WA), the Hunter Valley (NSW) and Port Augusta (SA) and eventually lead to the creation of other environmentally-friendly projects which will be leased to lower wage earners. Mondragon, a post-war co-operative formed by Basque Fr. Jose Arizmendiarrieta to build domestic heaters, and that today employs 84,000 people across many sectors, is an inspiration to Earthworker. Cameron Neil of Netbalance, and veteran of the Fair Trade project (which is supported by numerous parishes in Australia and New Zealand), also noted the presence of the co-operative ‘elders’. He spoke of 85,000 African farmers, as well as many others employed locally in related packing, distribution, banking etc services, who are now receiving fair compensation for their coffee and chocolate as a result of co-operatives structures. These co-ops are not just about providing a fair price for commodities but ensuring the benefits flow to all people in the community, including children’s education, better health and access to water and sanitation. He recommended www.shareable.net and the book “Share or Die”, which showcases the role of ‘Gen Y’ in building a collaborative economy. Co-operatives initially sprang up from a love of people and a desire to provide more just and compassionate solutions for people’s needs. There was also a need for greater fairness in the different aspects of life: economic, political, social, religious and environmental. Co-operatives had also emerged from needs which had included: affordable funerals, housing loans, loans to furnish and improve homes, industry and employment, holidays, hospitals and medical care. Future: What are the needs now? Need for community involvement Need for people to feel connected and that they have a voice and say in their lives and environment (eg reduce carbon emissions) A more caring and integrative approach to community and life. Where to from here? More information on grassroots, community projects Sharing of wisdom and skills Lead agency to co-ordinate network? A look at some of the church’s assets and they might be used in a more just and sustainable way. A number of other cooperatives, including Borderlands (www.borderlands.org.au) joined in the final session discussion. Different ways in which co-operatives might help each other were suggested; to assist this attendees will be invited to make their contacts known to a network. It was agreed that Cardijn Community Australia and the Uniting Church liaise with Cooperatives Victoria to develop organisational details for a model of development. We will do what we can to assist each step toward the more civil society, and the more co-operative culture and economy that we all seek. Cardijn Community Australia wishes to thank the speakers, the Victorian Trades Hall Council for the venue and welcome, and to the Uniting Church communications for their voluntary filming of the event.